Bianca Andreescu, Félix Auger-Aliassime and Denis Shapovalov – in alphabetical order here not to show any favouritism – have just completed a fabulous four weeks in Indian Wells and Miami. Andreescu, 18, was sensational in winning the prestigious BNP Paribas Open title and Auger-Aliassime, 18, and Shapovalov, 19, made the Miami Open semi-finals and pretty well stole the show, except for the exploits of 37-year-old Roger Federer. There has been all kinds of talk about the talent of this trio of young Canadians but one basic fact remains – they hit harder and bigger than their opponents. Of the combined 30 matches (25-5) they played, Andreescu, Auger-Aliassime and Shapovalov were able to control play by over-powering their opponents. 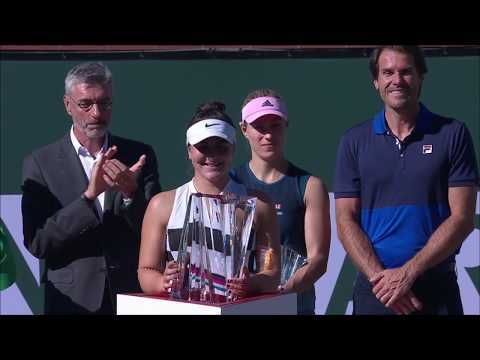 In Andreescu’s case, while there was much praise for the variety in her game – justly deserved – it remains that if she had not been dominating with the pace of her shots, she wouldn’t have had time for all the the drop shots, lobs, angles and slices that de-stabilized opponents and were fun to watch. The incidence of the Canadians’ power over their opposition was not total. Overall Anett Kontaveit hit bigger than Andreescu in their fourth-round match in Miami, but some or all of that could be attributed to the shoulder ailment that eventually forced the gritty Canadian to retire early in the second set. As for Auger-Aliassime, with the possible exception of the hot-and-cold Nikoloz Basilashvili in the round-of-16 in Miami, he was the player dictating the tempo of the rallies. In Shapovalov’s case, it’s hard to find an instance where he was out-hit in either Indian Wells or Miami except possibly for Hubert Hurkacz in the round-of-16 in Indian Wells. There were also fine lines in his matches against contemporaries Stefanos Tsitsipas and Frances Tiafoe in Miami – but he was superior as the ultimate results show. When Federer beat him in the Miami Open semi-finals, the outcome had more to do with the accuracy of the Swiss’ shots combined with Shapovalov’s erratic play rather than being a matter of brute power. The important thing to note here is that firepower/hard hitting only helps determine the outcome of a match if it’s combined with consistency. Essentially in Indian Wells and Miami, Andreescu, Auger-Aliassime and Shapovalov were able to hit big and also be more consistent than their opposition. That’s usually a winning combination. One without the other makes it harder to succeed. It’s not as though the three Canadians don’t have lots of competition in the area of big hitting. Among the women, Andreescu is yet to be tested against players such as Serena Williams, Naomi Osaka, Petra Kvitova and Karolina Pliskova. And Auger-Aliassime and Shapovalov will be measured versus concussive pounders such as Juan Martin del Potro, Karen Khachanov, Tiafoe and Nick Kyrgios (on a good day). The bottom line is that a lot of tennis is in the head so the effectiveness of sheer force on court is just as much a matter of competitive temperament and composure. Both Auger-Aliassime and Shapovalov came up short in those aspects in the semi-finals in Miami against Isner and Federer respectively. But at 18 until August 8, Auger-Aliassime and Shapovalov, 20 in exactly two weeks, are still in the phase of accumulating career experience. One gets the feeling that he loves playing tennis, but he also likes to have his privacy and do things such as playing the piano as he showed in this recent post on his Instagram account. It’s been a while 🎼😴 What should I learn next ? As for Shapovalov – there’s no question that, matched against his idol Federer last Friday, he froze in a 6-2, 6-4 loss. The extent to which he admires Federer was clear in remarks he made at this year’s Australian Open after a pre-tournament practice session in Rod Laver Arena with the 20-time Grand Slam champion. About Federer’s actual game, Shapovalov added: “It’s pretty crazy to see, what is he now, 37, 38 years old? He’s honestly still so fast. Obviously, he’s got the best timing. It’s unreal what he can do with the ball. But I never realized how quick he was until we actually practiced a couple of days ago. We were playing points. I felt like certain shots I should have had a winner, he’s just right there flicking another backhand at me. I felt like he’s constantly at the ball. Bianca Andreescu was done in by her body in the fourth round of the Miami Open so there has been no serious show of nerves by her in the 10-1 run since the beginning of Indian Wells. She certainly wasn’t at her best trailing Irina-Camelia Begu by a set and 5-1 (and match point down) in the opening round in Miami but that was almost to be expected in the aftermath of her surprise and emotionally-draining victory in Indian Wells four days earlier. Her ability to take the ball early and hit big may be tested in her next planned appearance – for Canada in the Fed Cup World Group Playoff indoors on red clay the weekend of April 20-21 in Prostejov, Czech Republic. She could have to face one, or both, of the power players mentioned earlier – Kvitova and Pliskova. Her biggest thrill in terms of who she has heard from since her Indian Wells triumph has been messages from Justin Trudeau and Shania Twain. Andreescu, Auger-Aliassime and Shapovalov have been so good so young that they beg a question which cannot really be considered a stretch anymore. Will one or more of them win a tour title (or titles) between now and the end of the summer at the US Open? In betting terms, let’s put the over/under at two – meaning two is a ‘push’ or tie in the lingo of wagering. So to win or lose you have to believe either it will be fewer than two or more than two. More than two may be a little optimistic, but just four weeks ago even one might have seemed like a long shot. Vasek Pospisil had lower back surgery for a herniated disc on January 18th in New York City. Ranked No. 75, he played his last match – losing to Benoit Paire in the qualifying for the Masters 1000 event in Paris – in late October. So he won’t be eligible to use a protected ranking – he is now No. 131 – for entry into tournaments until late April if he’s ready. It’s more likely he will wait until the grass-court events in June rather than any clay-court tournaments in May, except possibly for Roland Garros. An estimate of his injury-protected ranking would be close to No. 80. The 2019 Roland Garros poster is No. 40 in a series that began in 1980 and are commissioned through the Galerie Lelong in Paris. It was created by José Maria Sicilia, a Spanish artist born in 1954, and is only the fourth or fifth poster in 40 years to feature no obvious tennis reference.